I read this article and found it very interesting, thought it might be something for you. The article is called India’s Police Forces Spend Most On….Housing and is located at https://archive.indiaspend.com/investigations/state/indias-police-forces-spend-most-on-housing-85144. A recent episode of television docu-serial Satyamev Jayate highlighted the plight of policeman and policing in India. The problems addressed ranged from transport and mobility troubles to recruitment. We decided to look at the data on police expenditure and scan the general police budgets for the year 2013 in order to find out exactly what states are spending on when it comes to facilities provided for their respective police forces. These figures of the modernization of however do not show the expenditure on arms & ammunition. In fact the 40% of spending is on vehicles, followed by training with 20% and so on. We look at overall expenditure that the states and central government have incurred, followed by a focus on the police modernization fund. This fund is singularly dedicated to the improvement of police force through improvement in training, equipment and mobility. We found that expenditure has increased mainly due to increases in allocation to housing for policeman. We also found that most of the money under the modernization fund remained unutilized in states such as Gujarat and Maharashtra. The BPRD (Bureau Police Research & Development) is a central police organization under the ministry of home affairs and releases an annual publication titled ‘Data on Police Organization in India’, a principal reference for police statistics in the country. Expenditure on state police has seen a four per cent increase in 2013 over the previous year. About Rs 58,028 crore was spent on the police in 2013 in contrast to Rs 55,747 crore spent in 2012. A interesting figure that caught our eye is the huge jump in expenditure on police housing from the previous year. In 2011-12, about Rs 1,188.9 crore was spent on police housing, however in 2012-13, it zoomed several times to Rs 24,566.3 crores. Data over the past five years shows that there has mostly been an increasing trend in expenditure on police housing, except during 2011-12 where it fell more than 50 per cent. In an effort to try to see how the expenditure on housing jumped so drastically, we looked at the five states with the highest expenditure. Maharashtra’s expenditure on police housing increased by about Rs 16,607.53 crore in 2012-13 over the previous year. In 2011-12, expenditure on police housing in Maharashtra was only about Rs 3 crore, but in 2012-13, expenditure shot up to Rs 16,610.5 crore. Here’s a look at the expenditures for the rest of the top five states. Now let’s take a look at the physical progress in police housing in these five states. As on 1 January 2012, there were 95,825 family quarters available in Maharashtra, the highest in the country. In 2011, there were about 5,524 quarters constructed in the state. BPRD data says Chhattisgarh had 14,608 family quarters available on the 1st of January 2012, there were zero quarters constructed in 2011. The chart below shows the physical progress of the five states with the highest expenditures on Police Housing. Now let us look at the funds coming in. 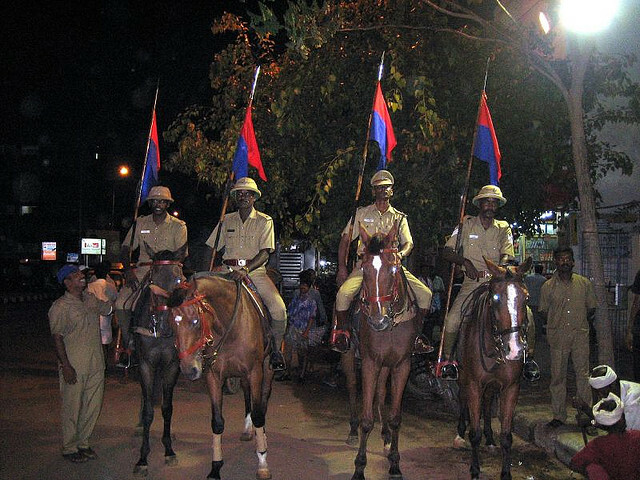 The police force receives a modernisation grant from the Centre which includes construction of police stations, outposts, barracks, police lines, residential quarters for lower and upper subordinate police personnel, procurement of vehicles, communication equipment, security / surveillance equipment, modern weaponry and creating training infrastructure facilities. The money is allocated (and is a non-refundable grant). From the table above we can see that at an all India level only 21% of funds were utilized. It’s interesting to note that the state of Jammu & Kashmir has actually utilized more than the sanctioned amount under the MPF funds. Tamil Nadu which we reported a few months ago had utilized only 60% of its funds in 2012 actually managed to increase utilization to 100%. The rest of the states in the table show a 100% utilization of their MPF funds. Other states such as Maharashtra, Gujarat and Karnataka have not used the funds assigned to them. The money under MPF is also set aside for vehicles and police training. Nearly 15-20% of the funds under the scheme are utilized for improving mobility. The number of vehicles has improved from 96,791 vehicles in 2004 to 153,504 in 2012 which is an increase of 58%. Despite the increase there is an overall deficiency of 32.2% i.e there was a requirement of 226,241 vehicles but the vehicles made available were only 153,504. The medium category vehicles (jeeps) have seen the highest amount of deficiency of 64%. The following states have the highest number of vehicles available with states. Even though money has been spent on vehicles but there very less attention paid to the upkeep of these vehicles. Abhinav Kumar, a Indian Police Service (IPS) officer from Uttar Pradesh (highlighted in the show Satyamev Jayate) said that a key concern for police forces around the country is petrol costs. The current sanctioned limit for petrol is somewhere between 150 to 250 litres per police station in the states. That works out to an average of five litres per day which is far less than the actual requirement and many police stations actually run out of their fuel supply in 20 days. Reportedly, fuel for the next 10 days is sourced through means which may not be most police-like. Another important aspect of the MPF funding is police training. A total of 1,03,352 police personnel from States/UTs police forces were given in-service training during the year 2011 in the country. Among other things under MPF scheme, spending on forensics vans has not seen much improvement – in fact only four new forensics vans were added all over the country. The states of Tamil Nadu and Rajasthan have the highest number of forensics vans in country with 42 and 44 respectively. Mobile forensics vans help in gathering crucial biological evidence that does not have more than six months’ shelf life in preserved form. After six months the samples, including of blood, DNA and viscera, begin to decay – making identification impossible. Finally in the case of police stations equipped with computers, a total of 8,274 during 2011 were added. The states with highest number of computers available are Karnataka with 8,112, Maharashtra with 7,510 and Rajasthan with 5,021. In conclusion, the police is a state subject and no matter how much the central government tries to improve their condition it is up to the states whether they want the change or not. There is also a need to improve the operational capacity of the force rather than merely recruiting more constables (70,064 constables were recruited in 2012), though those numbers are short too.